It is holy week. Spring, in all its popping and blooming and rejuvenation is turning the world majestic. I can feel my own slip of soul opening, thawing with the ground. Spring, we’ve been waiting for you. Yesterday we celebrated Palm Sunday and welcomed the holy days. Jesus is on my mind. And I am lighter, happier. Spring break is just a week away, and I can already feel the relief of slowing down, stepping out, doing less. Even sitting down to write today feels joyful. It has been too long. I think you know by now how much Holy Week means to me. I love it more than any other week. This year we are reading from J. Kirk Richard’s book, This is Jesus. Marking the days with his poetic, impressionistic depictions of the Savior’s life. I’m also loving this piece by Richards that I placed on our mantle. It is called Where Have They Taken Him? Since it is not spring break for us yet, we don’t have the luxury of fully immersing ourselves in our traditions. But we will do the best we can. 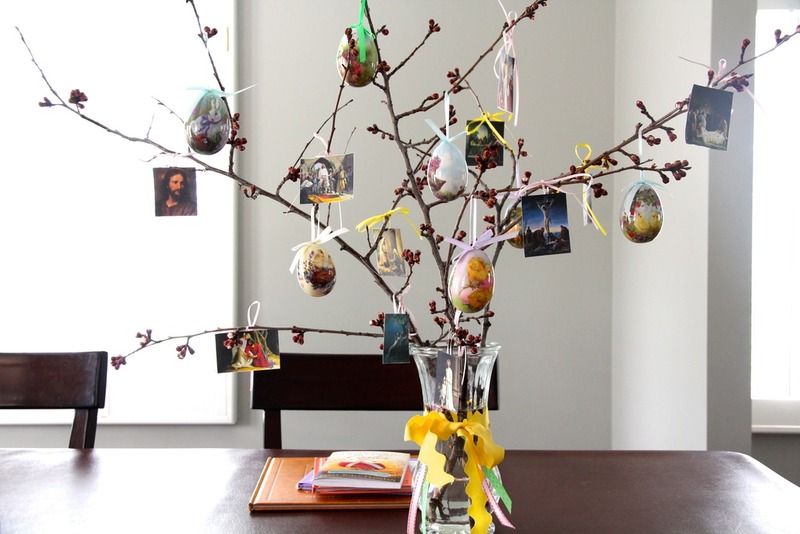 For Palm Sunday we made our Easter Tree. Boughs cut from one of the apricot trees in our backyard. Tuesday I will do work in the temple. On Holy Thursday we will have our passover meal. Good Friday we will make hot cross buns and do our Easter Walk. Saturday, we will color eggs and hang our lanterns in a new tree, maybe don the steps of our front porch with jars of light. On Easter Sunday we will attend church, hunt for baskets, celebrate with family. Each evening we will watch the bible videos that capture so beautifully the Savior’s last days, talk meaning, tell story. And this article by Daniel H. Ludlow has a wonderful synopsis of what happened historically from Sunday to Sunday. I was especially touched yesterday morning, Palm Sunday, as we dressed and prepared for the dedication of the Provo City Center Temple. The event could not have been planned for a more fitting Sunday. When LDS temples are dedicated, patrons bring white handkerchiefs for a ceremonial tradition in which we shout Hosannas to God. We do not wave palm branches, but we do wave handkerchiefs. In celebration and gratitude. Declarations of Christ’s saving power. An invitation for the Lord to receive and accept a temple as his house. Yesterday, as we shouted Hosanna, with thousands of other saints, I thought of Jesus not just coming to his temple, but into Jerusalem, and into our lives. Two weeks ago, I pulled the kids out of school and drove south so we could tour the interior of that temple. In December 2010, this gorgeous building, which was the historic Provo Tabernacle, was destroyed by fire. Now, it has been rebuilt. Restored. With even greater architectural beauty. I love this picture of Gordon. He was the only one that day who cooperated for a photo. It made me imagine what he might look like at missionary age. All of them, however, were wowed by the temple rooms, the dark wood railings, the spiral staircase, the artwork, and the stained glass windows. Spencer whispered to me as we walked in, “Mom. I feel something special. I think it’s the Spirit.” It was a sweet experience. On the home front, warmer weather has meant lots of exploring in the new yard. Ali has been making teensy bouquets of blue corn flowers. Spencer and Gordon pulled out all the tools in the shed and started turning the garden. The garden plot is big. We don’t plan on keeping it. We will likely grass it in this summer and build grow boxes for our garden. But for now, they love the idea that they are being productive. Mostly they collected worms. 47 to be exact. The crocuses are out in full color. But our tulips unfortunately… have been eaten by the deer. Next year I’ll make sure we spray early, but for now, we can’t get over the magic of having these four-legged visitors wander into our yard some mornings. A week ago on Saturday, four of them hopped the fence and came gently plodding down the hill. At first we just watched from the windows. But it was too hard to shoot through the reflection of the glass and the shuttered slats. And the kids wanted to get closer. The deer watched us carefully. But they didn’t run. They came back three times that day. And by early afternoon, made themselves comfy in the shade. We were all abuzz watching them. Gordon and Spencer call them their buddies. In fact, I have to show you this watercolor Gordon did for the school art contest. He called it Deer of Happiness. Came up with the title all on his own. And drew these awesome details. After sketching it, I talked him through the watercoloring. People say we won’t like the deer when they start eating all our plants. But right now, I think they’re charming, graceful, and beautiful to watch. The artwork takes me right back to my childhood. St. Patty’s Day was full of funny tricks and wearin’ o the green. These boys made quite the statement with their plaid suspenders. And it was a very lucky day for Eliza, who got her braces off! Today she watercolored and cut these palm leaves for our mantle. It is a holy week. And we are full of rejoicing. That Easter happened. That Christ is truly risen. All new life is a metaphor for his existence. Each crocus, each puffing apricot blossom, each tulip, and even a building – once damaged and destroyed, made new again for higher purposes. I see these symbols and remember. All of us can be made new. Not just tomorrow, when our imperfect, struggling bodies will be made right. But now. In our hearts. Because of his healing reach. Shout! Shout hosanna to his name! And may you have a lovely, holy week. Catherine, you are amazing! And so beautiful in your thoughts and hopes and faith. As I end almost every comment here, thank you. Thank you for the lovely reminder of the importance of this week and for sharing the joy and traditions of your family. Can I be adopted? It would be so fun to be there for each event. Love you! My mother in law made us a set of "resurrection eggs" that we use every year to tell the story of the crucifixion and resurrection. Her eggs have the scriptures and a little item to represent what that particular scripture is about. The kids love that the last one is empty, because the tomb was empty. It is small and a little corny maybe, but they love it. But we need to do some more, maybe next year!